One German community removes lights and signs in a daring experiment and sees accident rates decline. Bohmte, Germany - When Ulrike Rubcic heard that her town would take down all of its traffic lights, she rolled her eyes in disbelief. Two months into the experiment, "Instead of thinking, 'It's going to be red, I need to give gas, people have to slow down, to look to the right and the left, to be considerate" says Ms. Rubcic. The bonus? Town people recognize they have become a bit closer to one another. "The whole village has become more human. We look at each other, we greet each other," she says. In recent years, initiatives that aim at rescuing streets from the hegemony of cars, giving more space for pedestrians and cyclists and combating increased speed, traffic, and trouble have popped up in cities across Europe. In a new experiment, "Paris respire," the banks of the Seine are closed to traffic on sunny days. Switzerland has set up "zones of encounter" where playgrounds or landscaped areas force cars to slow down and pedestrians have priority. Hundreds of Dutch neighborhoods have successfully done away with traffic signs. But Bohmte broke new ground. In Germany, a country fond of rules, Bohmte did what politicians had hitherto not dared to do. "What's revolutionary about Bohmte is that it took off its signs on a state highway with a lot of traffic," says Heiner Monheim, a traffic management expert at the University of Trier, speaking at a recent European conference on sign-free towns convened here. Beyond that, Monheim says, the model's real legacy is to have brought people closer to "rediscovering and appreciating cities not only as traffic places but also as human, social places." Just like so many other German communities, Bohmte's location as a busy artery was both its blessing and its curse. Close to 13,000 cars and trucks would speed along its main street every day. "Drivers didn't care about kids," says Klaus Mueller, strolling about with his grandchild and noting that the flow of cars is more slow and steady now. Because Bohmte's main street is a state highway, the town cannot forbid truck traffic. 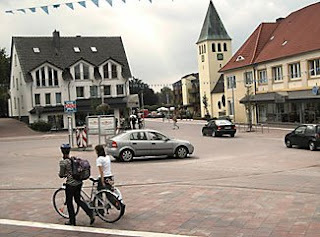 Mayor Klaus Goedejohann knew that the heavy traffic spoilt the town's atmosphere, but that it also provided the town's livelihood. "How do we manage to meet the interest of all the traffic participants without excluding anybody?" he recalls thinking. Then Mr. Goedejohann heard of a radical traffic-management philosophy called "shared space." Pioneered by a Dutch engineer who thought towns were safer with fewer rules, it envisioned open surfaces on which motorists and pedestrians could "negotiate" with one another by eye contact, other signals, and a greater consideration for one another. Segregating cars and pedestrians was wrong, argued Hans Monderman, whose death this winter rekindled people's interest in his ideas. Portrayed as a dangerous maverick decades ago, Mr. Monderman put in place more than 100 shared-space schemes in the Netherlands. When the European Union launched a research project on shared space, Bohmte decided to try it, along with six other towns, including Ostend in Belgium and Ipswich in England. Not everybody feels good about the town having spent close to $3.3 million on redesigning its downtown. On the day of a shared-space conference in Bohmte, Franz Josef Breiner walked hesitantly on the main street's flat surface with his cane, assessing the ground. He is sight-impaired and cannot make eye contact with drivers: shared space robs him of the safety nets that were curbs and sidewalks. "In theory shared space is more human, but we're left out," Mr. Breiner says. Although shared space "offers a chance to win back space for nonmotorized participants," skepticism also runs high because many people worry that the children and elderly will not be able to communicate with drivers. Still, a 2008 study in Holland reported that shared space has reduced the number of accidents in sign-free areas. Goedejohann, Bohmte's mayor, is confident. His town averaged 50 accidents last year. Since the shared space concept was enacted, there haven't been any, he says. And other city governments are reacting. In Hamburg a new coalition of green and conservative politicians have pledged to design shared space streets in every neighborhood. "My theory," Monderman said last fall at a new urbanism summit in London, "was if you want to make people behave in a village, maybe you have to make it feel like a village."